I just returned home from 18 days in Australia. I started out in Sydney four days. 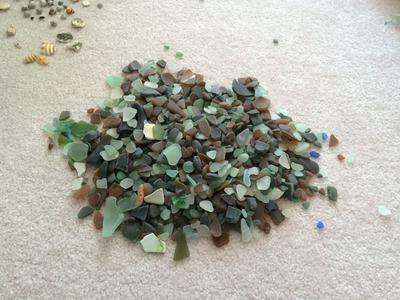 Upon another writer's recommendation, I looked between Manly and Shelly Beaches and found the stated site amongst rocks that produced a large quantity of sea glass. The area is protected with signs posted as "no pick-up" of shells or marine life. 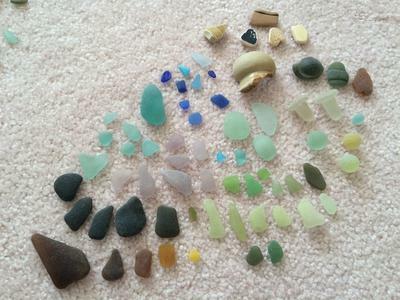 A passerby was quick to remind me of this, so I assured him I was picking up sea glass, not shells. Please respect this request, especially since heavy fines can be imposed. It is important to check ahead as to what time is low tide or you'll have difficulty. I found several hundred pieces in this area during a couple hours of low tide in two days here. I'm certain you could acquire more with snorkel gear because you can see a vast layer just beyond reach. There's a new batch with each wave. I found the common white, brown, green, aqua, as well as a half dozen lilac and a couple marbles. Shelly Beach had a few pieces but not enough to warrant the time involved. It has beautiful blue shells everywhere, but, unfortunately, strong fines are imposed if you pick them up. I also searched Malabar Beach. You will find a good deal of brown and white, but few other colors, and there were jelly fish everywhere. The pieces are good quality jewelry grade. If you must make a choice, choose the previously mentioned beach near Manly. Manly is accessible by taking the train to Circular Quay and hop on a ferry to Manly Beach. Walk a short distance to Manly and continue to the right along the boardwalk just before you reach the oceanside "swimming pool." There are steps down to the rocky areas. Remember, searching at low tide is key. 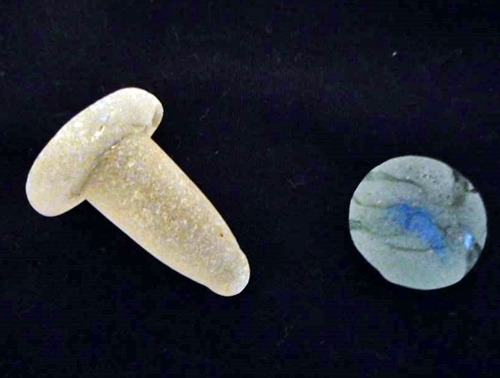 Later during the holiday, I searched around the beaches at Phillips Island and Wilsons Promontory, but there are few shells and not one piece of sea glass. Anne Cram added a new photo to Sea Glass Odyssey's Timeline. 'These are my two best finds to date. Thank you for this very thorough report Pat. We know that there are many fans in Australia that will appreciate the great information and the photos.